Kriti Sanon attended Deepika and Ranveer’s wedding reception wearing a strapless embellished gown by Monisha Jaising. 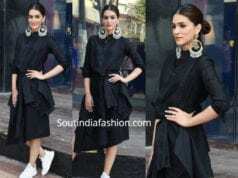 She styled it with statement earrings and rings from Minerali Store. Subtle makeup and wavy hair rounded out her look!